Michelin Energy Saver A/S tires combine solid wet and dry pavement traction with added fuel efficiency that any driver will appreciate. In fact, this is Michelin’s most fuel efficient tire that they manufacture. The tire itself has a silica based tread compound with a symmetrical tread pattern that increases traction and improves braking performance on any road surface. Independent tread blocks and additional sipes in the design help enhance handling and cornering, while circumferential and lateral grooves give the Energy Saver A/S better wet pavement handling and a reduced risk of hydroplaning. Fuel economy is increased due to the unique Michelin Green X technology and much lower rolling resistance the tread compound sports. Michelin claims 8% more fuel efficiency than a leading competitors tire, which we find supported by many tire owners as well. Inside the tire you’ll find twin steel belts with a polyamide wrapping that sit atop a polyester carcass, which adds more strength and stability at higher speeds as well as better comfort and tire wear. The warranty backs this up as it covers the tread life for up to 65,000 miles. Overall, the Michelin Energy Saver AS provides very good performance regardless of weather conditions, while also increasing fuel mileage and saving you money. With an excellent warranty to back it up, it comes in at a solid value for the money. Prices on the Michelin Energy Saver range from around $116 for the 14 inch series to approximately $137 for the larger 17 inch series tires. Get the best tire price with Michelin coupon below, or find other tire coupons here. Who Are Michelin Energy Saver AS Tires Designed For? Michelin has designed the Energy Saver A/S for drivers of fuel efficient and hybrid coupes and sedans who are looking for excellent all-season traction and a longer tread life, to go along with added fuel economy. Michelin backs the Energy Saver A/S with a 6 year or 65,000 mile tread life warranty on tires with an S, T or H speed rating. Models that are V speed rated are backed for 6 years or 55,000 miles. 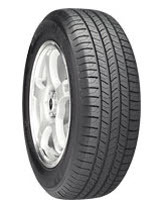 All tires have a one year or first 2/32 inch of wear guarantee on the tire’s uniformity. Materials and workmanship are covered for 6 years and include a free tire replacement during the first year or first 25% of wear. This is followed up with a prorated amount for the remaining time period or until the tire reaches its final 2/32 inch of useable tread depth. A 3 year flat tire changing service is also included in the warranty package. Finally, Michelin Tires provides a 30 day satisfaction guarantee in which you can exchange the tire for another Michelin model.